Thanksgiving dinner celebrates friends, family and the abundance you share, but it can take a toll on your waistline. You can indulge in great taste without overindulging in fat, sugar and salt with a few simple switches. These changes add plenty of flavor to your Thanksgiving feast while taking away some of what you don’t need on your plate. Canned yams in heavy syrup taste more like dessert than a side dish, but the natural sweetness of oven-roasted sweet potatoes still in their skins is a perfect foil for the savory delights on your table. Sweet potatoes are high in vitamin A and fiber, so they’re a healthful choice when they aren’t swimming in syrup. They’re also easier on the chef than the usual yams. Just prick the skins with a fork, wrap them loosely in foil to prevent leaking, and pop them in the oven with the turkey for an hour and a half or so. 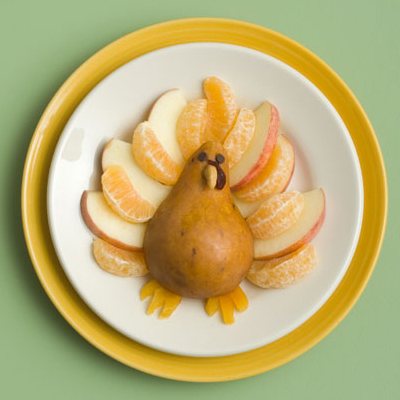 Serve them split and sprinkled with cinnamon for a deliciously healthy Thanksgiving dish. Adding pecans, walnuts or almonds to a stuffing mix that’s mostly carbohydrates improves its nutritional profile. Nuts are high in calories, but they pack plenty of healthy fats and protein into a small package. By replacing some of the empty calories in stuffing with nuts, you add nutrition and flavor. Incorporating more fruits and vegetables in your stuffing lowers calories and adds nutritional value too, so consider cranberries, raisins, celery and diced apples your allies when making a stuffing. Chicken stock has rich flavor and few calories, so it’s an excellent choice for lightening a dish without taking away its taste. Use stock instead of milk or cream to moisten your mashed potatoes. Cook brown rice in stock with shallots, mushrooms and herbs for a flavorful side that’s full of nutritional benefits. Choose unsalted stock for cooking and salt the dish to taste as it cooks to avoid too much sodium in the food. Cranberries are packed with vitamin C and antioxidants, but when they’re turned into jelly and canned, they lose some of those micro-nutrients. It takes a little longer to start with fresh cranberries than it does to open a can, but it’s well worth the extra time. Most recipes call for sugar because cranberries are quite tart on their own, but even a sweet recipe will have less sugar than the jellied version you get from the can. Add a bit of lemon or orange zest to make the dish your own. You’ll still get the flavor and crunch that make green beans a classic Thanksgiving side dish without the heavy doses of sodium and fat that come with the traditional casserole. Toast slivered almonds in a little butter until they’re golden, then remove them from the pan and add the beans with some olive oil. Add a clove of finely minced garlic and cook the beans to the desired tenderness. Stir the almonds back into the pan and serve a dish that has just enough butter to taste luxurious without the fat of the regular side. Making this switch gives you more fiber and flavor, but getting everyone to accept the more pronounced texture of whole-grain baked goods could take some persuasion. Instead of trying to conceal the texture, highlight it and make it a feature with nuts and seeds that add crunch. Serve rolls with whipped honey butter or herb butter instead of margarine to eliminate trans-fats and add great taste. Pie is a staple for Thanksgiving desserts, but you can get much of the flavor without the fat and carbs in the crust when you make a fruit crumble instead. Slice your apples, pears or other fruits as usual; then, top it with a combination of oats, cinnamon, brown sugar and flour before baking. If pumpkin pie is your favorite, make a pumpkin mousse and serve it in individual cups topped with chopped pecans for crunch.